Hackers are getting a bad rep these days in light of what happened at Sony, and more recently, the White House. But legit "white hat" or "good guy" hacking is vital for testing website and device security, plus it's great for modding your setup. This bundle of courses teach the ethical route into hacking. 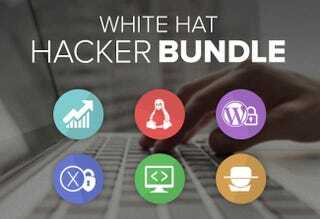 Starting from scratch, this bundle teaches you penetration testing (that's hacking your own site or device, in case you were wondering…), Wordpress security, working with OS X's advanced admin options, controlling Linux's command line, and scraping data from the web. In other words, all the skills needed to test the digital locks on your valuable stuff. Currently, these 6 courses — which total 40+ hours of content is going for $49. Learn the Basics of Ethical Hacking and Penetration Testing – How to find and exploit vulnerabilities in your target infrastructure and in web apps. Advanced White Hat Hacking and Penetration Testing Tutorial – Test your network and protect it from unauthorized access, and secure your hardware from attack. Advanced Mac OS X - Technical and Security Skills – Secure your Mac, gain a solid understanding of the operating system, and carry out advanced tasks. Web Guard Dog WordPress Security – Make your WordPress website safe from hackers, protect against bandwidth/content/product theft, and stop unwanted public indexing of sensitive information by search engines. Mastering the Linux Command Line – Tips and tricks on using the Linux command line, controlling directories and file management, plus streams, piping and redirects. Web Scraping for Sales and Growth Hackers – The basics of web scraping, creating large targeted lead lists from data available on the web, and content marketing using sites like Reddit and Hacker News. All of these courses come with unlimited lifetime access, plus you get a certificate of completion for each course you finish. Head for the link to grab the deal.